Put the pork in a slow cooker. Add half a jar of Korean-Style Barbecue Sauce. Cook on low for 8-10 hours, or until tender. This pumpkin platter is from Mikasa, before they closed their outlet store. The cookies are chewy and spicy!! You could make a sandwich cookie with the dip in the middle and then freeze. Years ago, a good friend shared this dip recipe with me. This makes a lot of dip, so it's great for a party. You could also use the leftovers and put in a gingersnap or graham cracker pie shell. The dip is soooo creamy and perfectly spicy and goes great with gingersnaps or apple slices. I made the Ginger Crinkle Cookies that my bloggy buddy, Lynn, shared from happierthanapiginmud.blogspot.com/. Lynn got the original recipe from another bloggy friend, Lorraine at gratefulprayerthankfulheart.blogspot.com/. These cookies are perfect for this dip. Thanks Lynn and Lorraine! I hope you try both the cookies and the dip recipes soon. If you don't feel like making cookies, the gingersnaps from World Market are great, too. My favorite good witch, from Homegoods, is presiding over the table to whisk away the crumbs, after the party is over! How about some witch's brew to go with the cookies? The napkins are from Target. The tablecloth was on clearance from Kohl's. A Cinderella pumpkin serves as a pedestal for the platter. Beat the softened cream cheese in a large bowl. Add the pumpkin pie filling mix and mix well. Fold in the thawed frozen mixed topping. Serve with gingersnaps and/or apple slices. Dab of frosting between "bones". Frost the top of the cupcake and set aside. Add sprinkles to the top. Thread the pretzels onto the lollipop stick, adding a dab of frosting between each one to anchor and hold in place. Decorate the marshmallow by poking in the M& M's for eyes (or use the black gel). Add a squiggly grin. Put the marshmallow head on top of the lollipop stick and unsert into the cupcake. There you have it...a cute little skeleton for your own little trick-or-treaters!! Note: If you use chocolate frosting on the cupcake, you can use the "bone" sprinkles. I just didn't happen to have any. Is this not the cutest Hello Kitty pumpkin ever??!! My hubby and I took a fun trip to Arkansas over the weekend with our youngest son and our DIL to our friends' farm. What a wonderful time we had! While we were gone, we left our son, Mike, that is still recuperating from surgery, with prepared meals. It's been over a month since his surgery and we felt okay leaving him. I had bought a pumpkin because Mike wanted to carve one. He and our youngest son are both video game artists and have been drawing and creating since they were little. When I walked into the house, Hello Kitty greeted me!! Isn't she adorable??!! Didn't he do a great job? I used some Hello Kitty fabric from JoAnn's on my little kid's table, with Hello Kitty as the centerpiece. Target has the cutest Hello Kitty melamine set. 1. After scraping out the seeds from the pumpkin, rinse and drain them. 2. Let the seeds dry overnight. 3. In a bowl, add a little olive oil and sprinkle on some Tony Chachere's Creole Seasoning. If needed, add a little kosher salt. 4. Line a baking pan with foil. 5. Add the pumpkin seeds to the pan and spread out. 6. Roast at 225 degrees for about 1 hour, 20 minutes, stirring every 20 minutes. Taste as you go for desired seasoning and roasting level. I wish I could keep her! Here's a three ingredient recipe for a football game- watching day. I've made them twice now and they always get rave reviews. I originally saw this at www.allrecipes.com. If you want a great meal with little prep, try this out! If you're afraid of the heat from the hot sauce, it really isn't that strong. Here's my slightly adapted recipe. Put all ingredients into a slow cooker. Cook on low for 6-7 hours. Towards the end of cooking, shred the chicken with a fork and mix all together. If you want, you can add the 2 T. butter and stir into the mixture. Put chicken mixture into the bun and serve with more hot sauce, or some ranch dressing on top is really good! For our outdoor breakfast, I used a black polka dot topper, my pumpkin bowls and black towels as napkins. How about some chai tea to go along with the oatmeal? My centerpiece is a vintage-looking pumpkin head character from Tuesday Morning. The bicycle is a cute find that my dear friend bought at Big Lots. The little fella in the front basket is from Dollar Tree. The ghost and pumpkin are from years ago. I LOVE oatmeal and eat it year round, but recently I saw a pumpkin version done in the slow cooker on thebetterbaker.blogspot.com/, I always make mine in the microwave and oh my, is this ever good for the Fall. Now what makes this DECADENT, you ask? Here's the secret......a scoop of vanilla ice cream on top!!! I learned of this treat years ago from a friend and it just melts right into the hot oatmeal and you don't need any sweetener. I use sugar-free ice cream or frozen yogurt on mine. It may just change how you feel about oatmeal. I made this for our son that's still recuperating from surgery and he said, "How could something so simple taste so good?" I hope you try it! Put all ingredients together into a microwave-safe bowl, stir together and then microwave for about 2 minutes (depending on your wattage). Stir again and top with a scoop of ice cream! Enjoy!! Sandi at Rose Chintz Cottage is having a party with the color pink for breast cancer awareness month. Tea and a 3-2-1 cake is a perfect afternoon tea party treat! Wouldn't this make a pretty gift? I first saw this recipe on my friend Marsha's blog at thebetterbaker.blogspot.com/. I mixed the cake mixes up in a food storage bag and then measured individual servings out to give out as party favors. I tried one of these cakes and they are delicious and really take care of the sweet tooth. Wouldn't this make a great teacher, co-worker, assisted living resident or friend's gift?? I used mini snack size bags with the recipe included and they were perfect! You could also put the mix right in a pretty mug that the person could bake the cake in and then later use for their tea or coffee. In a food storage bag, combine the two cake mixes together and mix well. For each individual cake serving, measure 3 Tablespoons of the cake mix combination and mix it with 2 Tablespoons of water in a small microwave-safe container. such as a coffee mug, ungreased. Microwave on high for 1 minute, and you have your own instant individual 3-2-1 cake! Keep remaining cake mixture stored in the food storage bag and use whenever you feel like a treat! You can top each cake with a dollop of fat free whipped topping and/or some fresh fruit. I made a simple powdered sugar glaze to ice mine. I'm telling you, this cake is a fabulous treat!! These wonderfully tender meatballs happen to have ricotta cheese as an ingredient. The recipe makes about 24 large meatballs. I prefer to bake the meatballs. You can use some over pasta and still have meatballs leftover for several subs. Getting two meals out of one recipe is always a plus!! Baking for me is less messy than frying!! Combine all ingredients together/ Do not over mix because it will cause meatballs to be tough. Form the meat mixture into balls. Line a large rimmed baking sheet with foil. Spray the foil with non-stick spray. Place the meatballs on the sheet. Bake at 375 degrees for about 20 minutes. Heat the olive oil in a large dutch oven. Add the garlic and cook about 30 seconds. Add the crushed red pepper and tomato paste. Add the crushed tomatoes, and the seasonings. Stir to blend. Bring to a boil and then turn the heat down to a simmer. Add the meatballs. Cover the dutch oven and keep at a simmer for about an hour, or put the covered dutch oven in a 200-220 degree oven and cook several hours. You can also put all this in your slow cooker. It's still nice enough in Texas to enjoy a Fall meal outside. My iron centerpiece is planted with oregano, parsley and pansies with a mini pumpkin added for the season. The pumpkin bowls are by Maxcera from Homegoods and the detail is so pretty on them. They are called Watercolor Pumpkins. I'm using some homespun fabric napkins tied with raffia and some homespun fabric as a topper. Combine tomatoes, water, tomato paste, bay leaf, sugar and salt in a 4-cup heavy saucepan. Bring to a boil, immediately decrease the heat to medium, and simmer for about 20 minutes, or until mixture lightly coats the spoon. Whisk in the pepper and cream and continue cooking over medium heat for about 2 minutes or until thoroughly blended. I've seen the cinnamon roll pancakes and went to www.recipegirl.com to check them out. While there, I noticed a PUMPKIN version. Since I'm on a pumpkin kick right now, I thought I'd try them out while our son is here recuperating. He pronounced them "Delicious"! Now recipegirl claimed that this makes 8 pancakes. I, however, got 18 pancakes out of this recipe. I just refrigerated the leftovers and warmed them in the microwave. They're not quite as carmelized as fresh off the skillet, but they're pretty darned tasty. Swirl the filling on one side and then flip after bubbles form. 1. Prepare the cinnamon filling: In a small bowl- mix butter, brown sugar and cinnamon. Whisk the filling ingredients together and then pour it into a sandwich-sized zip baggie. Zip up the baggie and lay it on the counter while you prepare the pancake batter. I would suggest using two baggies, one inside the other, as mine split, and when that happens it makes a MESS!! 4. Check on your cinnamon filling: Knead the baggie to re-incorporate any butter that may have separated. You want the mixture to thicken a bit- it's best when it's similar to the squeezing texture of toothpaste. I actually stuck mine in the freezer for a few minutes. Don't try to use the filling for the pancake swirl unless it has thickened as it will be too runny! Snip off a small piece of the corner of the baggie. 5. Cook the pancakes: Preheat a large skillet or griddle to medium, and butter it. Use an ice cream scoop (or ladle) to add the batter to the pan. Use the bottom of the scoop or ladle to spread out the batter into a nice, even circle. Reduce the heat to medium-low. Pick up your cinnamon filling baggie and squeeze the filling into the corner. Starting at the center of the pancake squeeze the cinnamon filling on top of the pancake batter in a swirl (just as you see in a cinnamon roll). Cook the pancakes 3 to 4 minutes, or until bubbles begin popping on top of the pancake and it is golden brown on the bottom. Slide a thin spatula underneath the pancake and gently but quickly flip it over. Cook an additional 2 to 3 minutes, until the other side is golden as well. When you flip the pancake onto a plate, you will see that the cinnamon filling has created a crater-swirl of cinnamon. Wipe out the pan with a paper towel, and repeat with the remaining pancake batter and cinnamon filling. Serve pancakes topped with a drizzle of cream cheese icing. ﻿﻿﻿﻿Be prepared to taste the most decadent pancake! Years ago a friend wanted to go to Wendy's to have some of their chili. I told her that I had never had it. She told me that it was so good and that she even had a recipe that was supposedly like it. Well, I did try the chili and it was very good. She gave me the recipe and I've had it all these years and never made it. With our son here recuperating from his surgery, I thought a bowl of chili might be just what the doctor ordered!! I made the recipe, adapting it somewhat. After our son tried it, I told him that it was supposedly like Wendy's chili. He said, "Mom, this is better than Wendy's"...hence the name!! 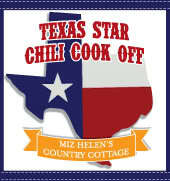 Miz Helen is having her 3rd Annual Texas Chili Cook Off. Be sure to visit her blog and vote for your favorite chili. I would love it if you voted for me. 1. Brown ground beef in large dutch oven. Add onion and continue to cook for a few minutes. Drain off fat. TIP: Using a potato masher breaks the beef into pea-size pieces. 2. Add the remainder of ingredients and bring to a simmer. Cook, stirring every so often for 2-3 hours. TIP: Use your oven as a slow cooker and put the whole pot in, covered, and cook at 220 degrees for several hours. Serve with shredded cheese, sour cream & avocado slices. Cornbread is always good with a bowl of chili. Click here for the recipe. We have four grown children and our third child recently had spinal disk fusion surgery. We asked him to let us care for him in his recuperation, as he can't drive for awhile and I wanted to make his meals and do his laundry. One day, my hubby and I bought him 10 pints of different flavored ice creams. Now, mind you, he is 6' tall and weighs 155lbs, so he can afford the calories. One evening I asked him which flavor he wanted and he responded that he wanted the classic vanilla. He said, "Do you have any hot fudge sauce?" I said, "No, but I'll make you some!" Don't we always take care of our babies, no matter how old they are??!! I have been making this sauce for a l-o-o-o-n-g time! It's fudgy, creamy and as our son said, "This is delicious!" (I updated this recipe to include some corn syrup, which I have found prevents the sauce from getting sugary in the fridge). In a 2 qt. saucepan over medium heat, cook sugar, cocoa, heavy whipping cream, butter, and corn syrup, until mixture is smooth & boils, stirring constantly. Remove from heat & stir in vanilla. Cool fudge sauce slightly. Refrigerate leftovers and reheat briefly in the microwave. Who-o-o would like to share a cookie and tea with me?? This recipe is an oldie and it happens to be one of my sister's favorites. In fact I still have the butterscotch chips bag that it was printed on. I happen to think that peanut butter and butterscotch mixed together create a wonderful flavor combo, and with the fudge filling in the middle...well, let's just say that it sends it over the TOP!! I hope you try this easy recipe! Makes 25 - 1 and 1/2" squares. My cute owl mug is from Kroger! Love it! !